New York : Arcade Publishing, 2017. I picked this book when it came into my library, intrigued by the cover. 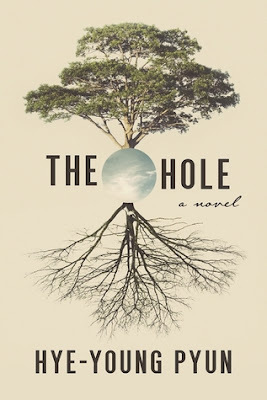 Then I realized that this very cover meant that I was reading the title as *hole, colouring my experience of the story. But the main character was a bit of an *hole so there it is. It's a short, dark, and eerie story of Ogi, a man who is in a car accident and ends up in a coma, and then when he awakes finds that he is paralyzed. He's taken home when his mother-in-law decides to move in and care for him. But the car accident has also killed his wife, her daughter -- and as the story progresses, she is not caring for him much at all. She is focused on finishing the yard work that her daughter started, digging a hole that keeps getting bigger and bigger. But as Ogi tries to practice moving so that he can get out of his room and see what's going on, he finds out that life with his wife wasn't as ideal for her as he'd thought it was. This was a dark read; I've seen some comparisons to Stephen King's Misery, as one example. I've never read that so can't compare for myself, but I think there's that sense of foreboding, isolation and being in the power of another person who doesn't necessarily have the same view of what's good for one as one does oneself, in both books. I wasn't a huge fan of this book, though, for that same reason. I could admire the structure and the increasing sense of the world closing in down to one small dot - but I didn't love the darkness and the violence and the despair. The conclusion was surprising, and made sense in retrospect. But I have to say this wasn't really the book for me in the end. I loved The Hole! I found it very suspenseful and couldn't put it down. That said, I love dark, despairing fiction, particularly when it's as creepy, even sneaky, as this novel.